It’s radish season again, here in Colorado. 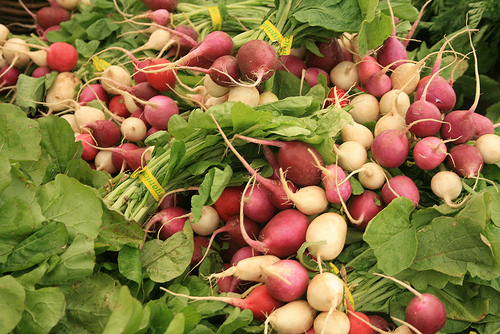 I know people who like radishes, but to me they taste like rubber bands. Actually, rubber bands taste a bit better. Before I started buying a farm share every year, I simply avoided the radishes at the grocery store and never gave them a second thought. These days, however, radishes invade my kitchen in the early summer. It happens every year. I open the farm share boxes, delighted with the lettuce and kale, and then think to myself, “What on earth am I going to do with more radishes?”. I tried giving them to the chickens, but they wouldn’t eat them either. As a last resort before sending them to the compost pile, I thought I’d try making them into something less healthy. And what do you know? It worked! My standard root chip recipe obliterated the undesirable radish flavor! You can do this with almost any root vegetable, such as turnips, parsnips, beets or potatoes. Beets are my favorite. A beet chip tastes slightly sweet and has a lovely red color. Slice very thin. This is best done with a mandolin, but be sure to watch your fingers. Mandolins are sharp! I usually set mine to the .03 mm setting, but any setting will do. Note that thicker slices take longer to cook. Toss the root slices with the olive oil until they are coated and add salt to taste. I usually add about 1/4 teaspoon per cup of slices. Mix well and place the slices on the baking sheet in one layer. Don’t pile them on top of each other or they won’t get crisp. Bake for about half an hour or until they are beginning to brown. Protect from hungry passersby while they are cooling. As with all root chips, you can’t eat just one! If you and your companions don’t eat them all off the tray, they can be stored in an airtight container for a day or two. A few minutes in the oven will make them crispy again if needed.